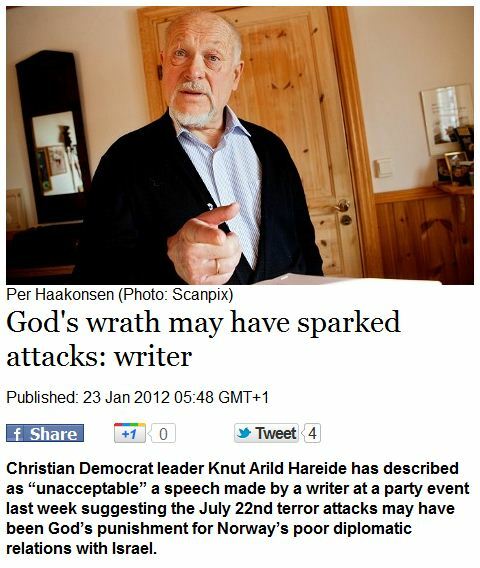 NORWEGIAN CLAIMS GOD’S WRATH REASON FOR BREIVIK MASSACRE……. – The Tundra Tabloids……. NORWEGIAN CLAIMS GOD’S WRATH REASON FOR BREIVIK MASSACRE……. Compounding pain with even more absurd notions. Next Post Next Post EU NAMES GERMAN ENVOY TO PEACE TALKS BETWEEN ISRAEL AND ARABS…….